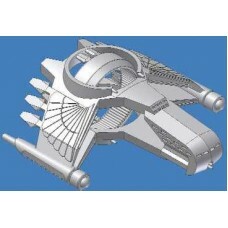 The War Leader light Cruiser is the ROM centurion of the fleet. These ships have specific missions with plenty of firepower and efficient crews. They can appear from nowhere, disarm your weapons and engines all before breakfast! Designed by Fury of Seraph and drawn by Drew is 2”L x 2"W x 7/8"H (51.3mmL x 51.5mmW x 21.6mmH) in three parts. Flight stand not included.